Today, the Shield Nickel Coin remembers when the farmer “discovered” the “Stone Giant” on his farm in upper New York on October 16, 1869. On Saturday forenoon, October 16, 1869, William C. Newell, a farmer residing near the village of Cardiff, in the town of Lafayette, county of Onondaga, commenced to dig a well near his barn. Two workmen were employed, Gideon Emmons and Henry Nichols, Mr. Newell being engaged meanwhile in drawing stone with which to line the well. At the depth of about three feet one of the workmen struck a stone, as he at first supposed. Further excavation disclosed the entire loot and a part of the leg. One of the workmen, seeing the direction in which the body lay, dug down just above where he thought the head might he, and his shovel struck the nose, the mark of which is visible on the statue. The face and head were soon uncovered and in a abort time the entire figure exposed to view. There then appeared to the few assembled spectators the colossal, well proportioned form of a human being. The news of this remarkable discovery spread rapidly through the surrounding country and attracted thither thousands of visitors, among whom were some of the most distinguished scientific men of the present day. Opinion of Prof. Hall, State Geologist. It is a statue, cut in gypsum, and intended to represent a human form of colossal size in a recumbent posture. As to its source or origin, I cannot conjecture. It is worn and dissolved by water to a degree that indicates long inhumation, and it is covered by an alluvial deposit of three feet or more in depth. The sculpture is of a high order and very different from those of Central America. Opinion of Hon. E. W. Leavenworth, Formerly Secretary of State. Those familiar with the frauds practiced in other countries in the manufacture and sale of antiques, and perhaps others, would have a vague suspicion that this might furnish another instance, nearer home. My own mind was not free from such dreams. And notwithstanding the apparent impossibility of finding a place where such a atone might be obtained—of quarrying, working, transporting and burying the same, and keeping it a profound secret, I still had my suspicions. But the first look at the statue dispels from the mind every thought of that nature. It has the marks of ages stamped upon every limb and feature in a manner and with a distinctness which no art can initiate. I have not seen the first person who entertained any doubt of its great antiquity, after looking at that most wonderful and inexplicable figure. The time spent in manufacturing and retailing the simple and absurd rumors which circulate through the community and find their way into the papers is weakly and foolishly thrown away. It is a serious and most remarkable reality, and one which as yet has received no satisfactory explanation and probably never will. Opinion of Professor Henry A. Ward, of Rochester University. Lying as it still does, in its original earthy bed, its gray massive form hardly yet still from the struggles by which it seems to have freed itself, and the face, body and limbs still damp with the ooze of its low supulchre, it possesses the beholder with a feeling of extremest awe and profoundest wonder. To interrupt these emotions by speculations as to its personality, to approach this majestic figure with the calm processes of scrutinizing investigation, seems a sacrilege. All one’s feelings persuade to accept it as a real human being, once instinct with live and activity, now a noble corpse. It is the work of the sculptor, and out of a single large block of the gypseous limestone (an upper member of the “Onondaga Salt Group”), which forms large beds in the immediate vicinity. Opinions of Sculptors Palmer, of Albany, and Brown, of Newburg; and Dr. Armsby, Professor of Anatomy in the Albany Medical College. Where so great excitement existed it was but natural that numberless rumors, pronouncing this wonderful discovery a humbug, fraud or deceit, should find their way into the columns of the public press. None of the stories which have gained circulation have, however, been substantiated by the slightest decree of proof. Among other stones it was stated that this stone image was of recent origin, and that within one year at least previous to its discovery it had been carried to Mr. Newell’s farm and surreptitiously buried, some persons even adding that Mr. Newell was himself a party concerned in the transaction. In order to disabuse the mind of the public a series of affidavits were made by all the parties charged with complicity or who might have any knowledge of the events to charged. The depositions are too voluminous for entire publication, but they can be seen at the above hall. William C. Newell, being duly sworn, deposes and says that he resides near Cardiff, upon the farm formerly owned by James Van Buskirk, which said Van Buskirk conveyed to deponent in the fall of 1866; deponent look possession of said farm in the spring of 1867, and has resided thereon until the present time; deponent further says, that Van Buskirk occupied said farm for about one year; that one William Wright, the father of deponent’s wife, owned and occupied said farm for about six years prior to the ownership of said Van Buskirk, and that for many years prior to the ownership of said farm by said Wright it was owned and occupied by one Rensalaer Mclntyre; that the “Stone Giant” was found upon said farm on the 16th day of October, 1869; that the only buildings upon said farm are the dwelling and barns; that deponent, prior to the discovery of said “Stone Giant,” had determined to dig a well adjacent to the barn and engaged the necessary laborers to assist in such work; in digging this well the Giant was found. The deponent further says that the place where the Giant was found has been cultivated by him for farming purposes (by ploughing and otherwise) for three years past; that the earth at the place where said image was found has never been dug or excavated in any manner whatever to the knowledge of the deponent, except in ploughing as aforesaid. Deponent further says he never knew until the said 16th of October nor had any knowledge or information whatever that said stone giant or any other image was lying at the place where the same was discovered. 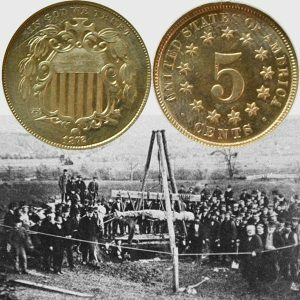 The Shield Nickel Coin shows with an image of the Cardiff Giant being removed from the earth in October 1869.